The Fed’s Rate Hikes: A Pause or A Stop? 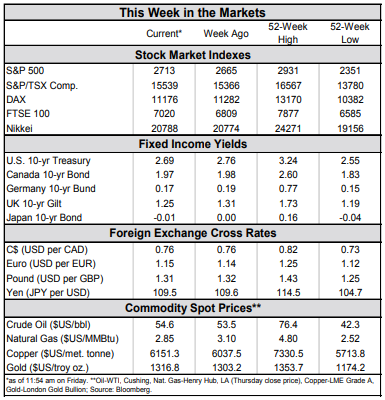 Concerns about slowing global growth continued to linger this week. 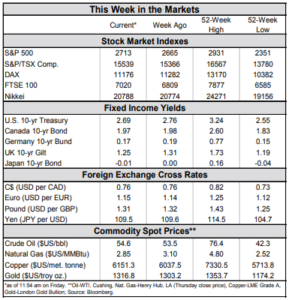 Even so, financial markets had a lot to be cheerful about: the U.S. government re-opened, the FOMC was dovish, the U.S.-China talks made progress and January payroll report showed blockbuster job growth. After a brutal December, this week’s trading capped the best monthly performance for the S&P 500 since October 2015. Top of the list, the longest shutdown in U.S. history has ended – for now. A short-term spending bill keeps the government funded until February 15th. Still, the damage has been done. Various estimates suggest that the shutdown has shaved between 0.2-0.4 percentage points off first quarter GDP growth, which is tracking 1.6% (annualized). While most of the lost economic activity will be recouped in the following quarter, some of the loss will be permanent. The impact of the government shutdown was also apparent in today’s payroll report. 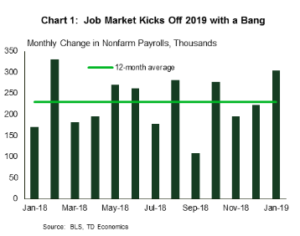 The unemployment rate move up a tick to 4.0%, lifted by government workers who were furloughed, and the broader measure of unemployment which includes people working part-time for economic reasons (the U6) has jumped up from 7.6% to 8.1%. Aside from those temporary distortions, it was a stellar report. 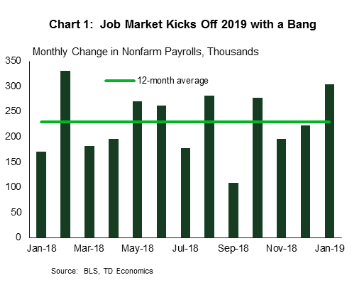 The labor market added an impressive 304k new jobs in January, marking a record-setting 100th straight month of payroll gains. Wages continued to advance at above-3% pace, and the core age participation rate kept moving higher, rising 0.5 percentage points over the past year. Meanwhile, across most other major economies, performance is shifting into lower gear. China’s economy is weakening: last year’s auto sales declined for the first time in decades, and manufacturing activity is contracting. That impact is being felt acutely by China’s major trading partners and American companies with significant exposure to the region. The export-oriented Euro Area economy also ended 2018 on a weaker footing, growing at the slowest pace in four years. Clearly, the toll on global growth from the U.S.-China trade dispute is rising, and the time to reach a deal before possible further escalation after the March 1st deadline is running out. President Trump was upbeat about the progress during this week’s negotiations, but important issues remain unresolved and any deal is unlikely until the two presidents meet in person later this month. 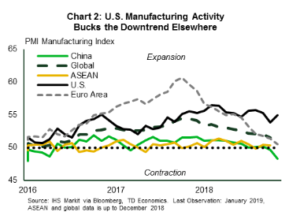 Global growth slowdown considerations did not go unnoticed by the FOMC. 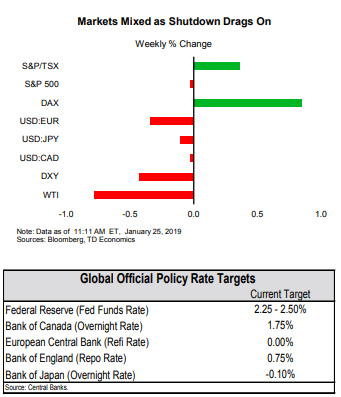 As widely expected, the Committee left the target range for the fed funds rate unchanged at 2.25%-2.5%, but the statement itself was very dovish. In particular, the committee acknowledged that, while domestic economic activity has been “rising at a solid rate”, risks to the outlook have increased, which would necessitate patience and flexibility on the Fed’s behalf. Any mention of “gradual” rate increases has been removed, suggesting the Fed is prepared to be patient for some time until the fog clears and its gets a better reading on global and domestic economic conditions.